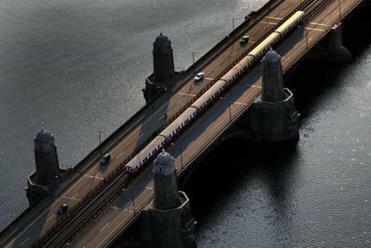 Red Line train service over the Longfellow Bridge will be suspended for 25 weekends but will still be available during the work week. 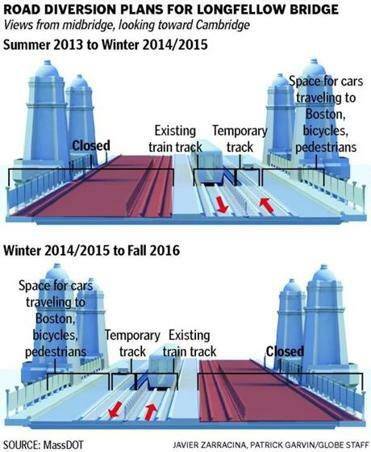 After years of discussion and planning, construction on the Longfellow Bridge is finally set to begin this summer — bringing with it a slew of traffic detours and MBTA service interruptions. The Massachusetts Department of Transportation’s board of directors voted Wednesday to approve a contract for the long-awaited renovation, clearing the way for the $255 million project that will lead to three years of disruptions, including the curtailment of Red Line service for 25 weekends and the elimination of northbound traffic throughout the project. Details of the long-dreaded diversions were revealed Wednesday. Through the duration of the three-year construction project, the bridge will only accommodate cars traveling from Cambridge into Boston. Traffic headed north will be diverted to the Craigie Bridge, adjacent to the Museum of Science. The road leading to Cambridge will be narrowed to one lane to allow for bicycle traffic. For 25 weekends, the Red Line will not traverse the bridge, and commuters will instead be shuttled via bus. The T will continue to run on weekdays, on temporary tracks on the road while workers perform maintenance on the permanent rails. The Longfellow, which opened in 1906, is in dire need of structural repairs. But over the last decade, advocates of eco-friendly transit pushed MassDOT to use the project as an opportunity to re-think traffic flow on the bridge and better accommodate pedestrians and cyclists. The plan for the bridge, announced last year, narrows the outbound car channel to one lane from the current two, providing space for wider bike lanes and sidewalks. After years of debate, the project — 80 percent of which will be funded by the US government — is set to begin. The firms that were awarded the construction project, J.F. White Contracting, Skanska Koch, and Consigli Construction, were given a clear mandate: The repair work could not interrupt weekday Red Line service and must allow for pedestrians and cyclists to traverse the bridge in both directions during the entire course of the project. Rewards and penalties that could add up to as much as $15 million are built into the contract to keep the project on schedule and the T closures to a minimum. The project must be finished by Sept. 30, 2016. 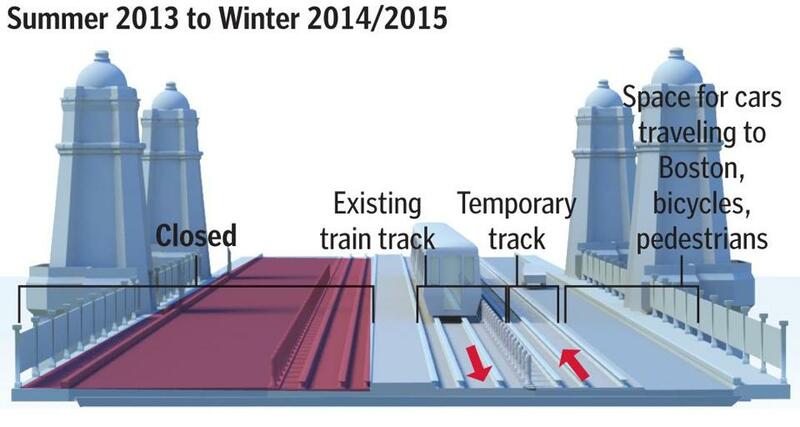 To keep the Red Line running, the firm plans to set up temporary tracks over one closed lanes. During the first half of the project, the Boston-bound side of the bridge will be closed, as well as the inbound Red Line track. Inbound T trains will shift to the outbound track, and outbound trains will ride along a temporary track on the eastern side of the bridge, squeezing next to a single lane of inbound car traffic. About 18 months into the project, workers will close the other side of the bridge, though car traffic will continue to only flow inbound. In anticipation of the steady flow of buses that will be required to ferry riders through one of the busiest sections of the Red Line, MassDOT’s Highway Division paid for 20 new MBTA buses that will be added to the T’s fleet after the construction ends. Outbound buses will travel on Craigie Bridge, while inbound buses will be the only vehicles allowed passage on the bridge during weekend closures. DePaola is confident that effective communication with commuters will help many avoid the route and find other ways to get to their destinations. The project will also include the construction of a new pedestrian bridge over Storrow Drive, an elegant steel fixture meant to mirror the subtle arch of the Longfellow Bridge. Tom Donald, director of bridge project management, told the MassDOT directors that the project strikes the right balance between the needs of motorists, cyclists, and pedestrians. “About 95 percent of the people in the room are pretty damn pleased with this,” said Richard A. Davey, transportation secretary. Jacqueline Y. Douglas, executive director of the urban transportation advocacy group Livable Streets, commended the fact that cyclists and pedestrians will have continuous access to the Longfellow throughout the three-year construction. “It’s really vital that people who bike and walk and take the T can go in both directions the whole time,” Douglas said. But, Douglas said, bridge designers could have gone further to accommodate future changes in traffic as more people turn to bicycles for transportation. Advocates had hoped that a crash barrier would be placed between the bicycle lane and vehicular traffic, a move that could have made it easier to implement those changes. “We would like to see those changes incorporated, to leave that flexibility for the future,” Douglas said. Correction: Because of a reporting error, an earlier version of this story misidentified the direction of traffic flowing on the eastern side of the bridge.